The launch immediately delivers Slyce technology to 1.75 million new consumers and enables "Shopper" App users to "Snap2Add" grocery items for the very first time. Editor's Note: There is one photo and one video associated with this press release. 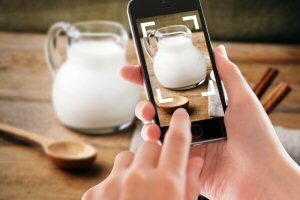 Visual product search platform Slyce Inc. ("Slyce") (TSX VENTURE:SLC) today announced the debut integration of its image recognition platform for grocery retailing within Purchase Decision Network's (PDN) leading grocery list creation App "Shopper". The "Snap2Add" functionality enables over 1.75 million users of "Shopper" to snap photos of grocery products around their home - including non-packaged items such as fruit and vegetables - and have them recognized and immediately added to their mobile shopping lists where they can instantly ensure product availability, achieve best pricing and automatically access coupon offers. "Snap2Add" is a first-of-its-kind, grocery-based image recognition application in the market and will seek to eventually replace existing technologies such as complex barcode-scanning altogether. It also creates a highly-targeted sponsored advertising network for CPG advertisers. As an example, brand sponsorships would allow brands to appear throughout a targeted users' entire experience or, alternatively, repeatedly appear as one of the listings for a relevant food category. Slyce will collect data on shopping preferences and product trends. Revenue to Slyce from the application is designed to be generated through targeted ad units, localized offers (couponing), affiliate product purchases, and BIG Data analytics. PDN currently powers 10 million shopping trips by over 2 million shoppers monthly across the different shopping experiences provided by its publishing partners. Slyce and PDN will share in all monetization vehicles around the integration. PDN is also expected to heavily promote the availability of the visual search functionality to other 3rd party shopping apps within its network. The Slyce grocery recognition functionality will be made available for integration into other branded grocery retailer apps. Slyce CEO Mark Elfenbein said, "We're incredibly excited to launch this latest implementation of our visual search technology. Within Shopper, Slyce and PDN have created an innovative and intuitive way for consumers to create mobile shopping lists while in their homes or out in the real world. It also presents significant opportunities for CPG companies and advertisers to reach shoppers at the exact moment of purchase intent." Sean Flynn CEO of PDN said "Snap2Add is really a new way to build mobile lists that is quicker and appeals to a more picture-oriented consumer. My daughter was able to build our weekly shopping list as you can see in the video. And she loved doing it!" The white label Slyce visual search technology for grocery retail will be debuted at NRF's Retail's BIG Show in New York City which runs from 21-23 January. The Corporation is a visual search technology company based in Toronto, Ontario and is engaged in the business of providing advanced visual search software that allows consumers to purchase products at the moment they discover them - in the real-world and online. Slyce has developed an advanced visual search platform that integrates with retail brands and digital content providers to give their customers the ability to instantly discover and purchase products that inspire them by simply snapping photographs with their smartphones or 'clicking' images on either their smartphones (mobiles) or desktop web browsers. Slyce's strategy is to position itself as a pivotal player in the emerging visual web. Slyce will provide its technology to retailers, brands, app developers and digital publishers, enabling their apps to recognize products for instant purchase. Slyce will provide its technology in exchange for integration, licensing and per search fees, percentage sales splits and big data provision and analysis. Slyce is currently working with a growing list of fortune 1000 brands and companies as well as multiple innovative developers. The Purchase Decision Network (www.pdnmedia.com) is the first and only native advertising network for CPG brands. PDN includes shopping apps that reach consumers across the purchase path as they plan, shop in stores and engage with the brands they love. PDN powers over 10MM shopping trips a month through best selling apps including Out of Milk, Buy Me a Pie, Our Groceries, Scan2List and Shopper.